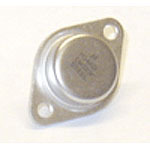 Motor control driver transistor used in Williams Hyperball. Rated 350 volts, 20 amps. NPN Darlington transistor in TO-3 case.